Trump's 'Muslim Ban' Is Already Happening, Immigrant Rights Advocates Say Muslim immigration to the U.S. is down sharply in the past year. The Supreme Court is weighing the legality of the president's travel ban this week. 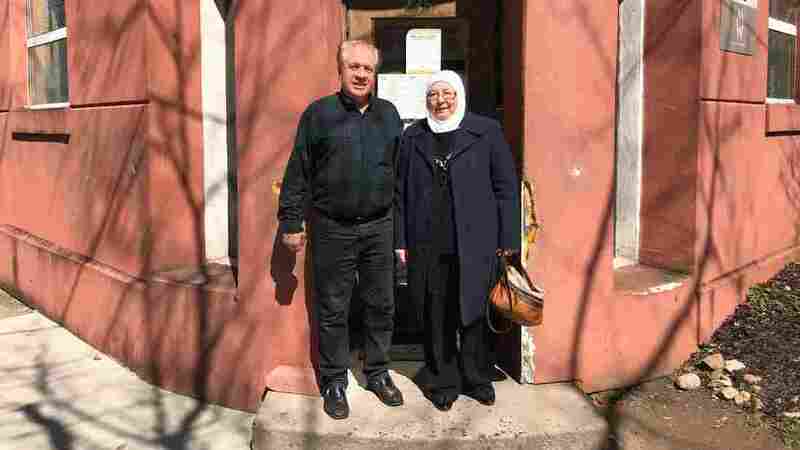 Haitham Dalati, left, and his wife Shiyam Daghestani, outside the offices of Integrated Refugee & Immigrant Services in New Haven, Conn.
No matter how the Supreme Court rules on the travel ban, immigrant rights advocates say the Trump administration is already achieving the so-called 'Muslim ban' that the president talked about during the campaign. Muslim immigration to the U.S. is down sharply since President Trump took office. Thousands of refugees and other would-be immigrants have been caught up in the administration's rapidly shifting immigration policies, leaving families scattered on opposite sides of the world. Haitham Dalati is a refugee from Syria who resettled in Connecticut last year after a federal judge put the first version of the travel ban on hold. Dalati and his wife hoped that their daughter and grandchildren would join them within weeks. More than a year later, they're still waiting. "This is so horrible for us," Dalati said. "I don't know now whether America is good or bad." The U.S. is granting fewer visas to immigrants, and admitting fewer refugees from around the world. But Muslims have been disproportionately affected. "The big picture is that far fewer Muslim refugees immigrants and foreign visitors are coming to the United States," said David Bier, an immigration analyst at the Cato Institute, who's been tracking a steep decline in immigration from Muslim countries. Among his findings: monthly arrivals of Muslim refugees are down 91 percent this year compared with 2016. Immigration from majority-Muslim countries is down 26 percent this year, while temporary visas to visitors from those countries fell more than 30 percent. The White House says its immigration policies are intended to protect national security, not to discriminate on the basis of religion. And the administration says it's started "extreme vetting" of refugees, which is necessary to protect national security. "The process is a little bit slower because additional vetting mechanisms have been put in place," said State Department Spokesperson Heather Nauert at a press briefing last week. Defenders of the travel ban point out that the latest version applies to only a handful of majority-Muslim countries, out of roughly 50 such countries around the world. They argue that falls far short of the "total and complete shutdown of Muslims entering the United States" that then-candidate Trump called for in 2015. But immigrant rights activists say the administration's real goal is to limit Muslim immigration. "The administration has found a more subtle way to carry out their Muslim ban," said Mark Hetfield, the president and CEO of HIAS, an organization that resettles refugees in the U.S. It sued to block the travel ban that led to widespread protests at airports when it was first implemented. "There was such a public outcry in January of 2017," Hetfield said. "The thing the public has to realize is that things are not better than they were then. Things are actually worse." Hetfield hopes the Supreme Court will reject the travel ban. But he says the administration's other immigration policies will continue to limit Muslim immigration to the U.S. And those policies may be even more difficult to fight in court.